How to upgrade the PROM code on D-Link DXS-3350SR 48-Port Switch 4 combo SFP 2 10GbE ports? How to upgrade the PROM code on an D-Link xStack series (DGS-3324SR, DGS-3324SRi, DXS-3326GSR, DXS-3350SR) switches? Step 1: Run HyperTerminal from Start > Programs > Accessories > Communications > HyperTerminal. Step 2: On the Connection Description window, enter a name for this connection. Click OK. Step 3: On the Connect To window, select the COM port that the serial cable is connected to using the drop-down box next to Connect Using. Click OK.
You will now see a blank screen which shows Connected at the bottom left hand corner of the screen. Step 5 Log into the switch and then reboot the switch. Step 6 Press “#” (Shift + 3) before the POST runs to 100%. Step 7 After a short delay, the switch will attempt to establish a connection to the Z-Modem, as shown below. Step 9: Choose the PROM file to be upgraded by utilizing the Browse button and pressing “Send.” After the file transfer has completed, the device will reboot automatically. IMPORTANT: During the reboot process, DO NOT power off the switch. Doing so will cause a boot failure and the device cannot be rebooted. The RMA (Return Material Authorization) process will be needed for recovery. Step 10: After rebooting, the PROM version will be changed. Please Login the D-Link DGS-3612G Switch,default IP is 10.90.90.90. The IP Address may initially be set using the console interface prior to connecting to it through the Ethernet. If the Switch IP address has not yet been changed, read the introduction of the DGS-3600 Series CLI Refence Guide or return to Section 4 of this manual for more information. 1. Select Manual from the Get IP From drop-down menu. 2. Enter the appropriate IP Address and Subnet Mask. 3. If you will manage the Switch from the subnet on which it is installed, you can leave the default address (0.0.0.0) in this field. 4. If no VLANs have been previously configured on the Switch, you can use the default VLAN Name. The default VLAN contains all of the Switch ports as members. If VLANs have been previously configured on the Switch, you will need to enter the VLAN Name of the VLAN that contains the port connected to the management station that will access the Switch. The Switch will allow management access from stations with the same VID listed here. NOTE: The Switch’s factory default IP address is 10.90.90.90 with a subnet mask of 255.0.0.0 and a default gateway of 0.0.0.0. Use the Get IP From pull-down menu to choose from BOOTP or DHCP. This selects how the Switch will be assigned an IP address. The IP MTU Settings window is used to configure the IP layer MTU settings on the Switch. The MTU is the largest size of IP datagram which may be transferred using a specific data link connection. The MTU value is a design parameter of a LAN and is a mutually agreed value (i.e. both ends of a link agree to use the same specific value) for most WAN links. The size of MTU may vary greatly between different links. Instead of making routers fragment packets, an end system could try to find out the largest IP packet that may be sent to a specific destination. When one IP host wants to transmit an IP datagram, it is usually preferable that the datagrams be of the largest size that does not require fragmentation anywhere along the path from the source to the destination. The path MTU is equal to the minimum MTUs of each hop in the path. IP Interface Name:Specifies the name of the IP Interface to be used. IP MTU (512-1712):The user can configure each interface’s IP MTU. If the user does not designate an MTU value when creating an interface, the default value of 1500 will be used. Step 1: Open a web browser and login to the web-based configuration of the DGS-1248T. Step 2: Click VLAN on the left. Step 3: Click Add New VID. Step 4: Enter the VID number. This must be a number between 2 and 4095. Select the ports that you want in the new VLAN and then click Apply. Step 5: Select Port VID Setting using the drop-down list next to IEEE 802.10 VLAN. Step 6: Enter the VID next to the corresponding ports and then click Apply. Step 7: Un-check the ports you configured with the new VID from the default VLAN and then click Apply. 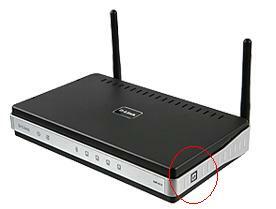 What is the button on the side of D-Link DGL-4500 router used for?